At the beginning of this assignment, I set out to look at traffic patterns and the transportation system that is currently in place in Downtown Raleigh. My initial observations were collected and recorded using a holistic approach at 309 West Martin Street in the Warehouse District of Downtown Raleigh. Since I have a Summer internship at a local art gallery, the Visual Art Exchange, in this area of Raleigh, the front window of gallery provided to be a wonderful place to look out and gather information. While most of my data collection came from sitting behind the front window of the Visual Art Exchange, I also walked around Downtown to gather more information on the transportation system that is currently in place. At this time in the assignment, I didn't have a clear focus and looked at transportation in all of its entirety. When collecting data, I made use of a few different approaches. Using time lapse videos, shown above, I recorded the actions and movements of different types of inner city transportation. I recorded the number of each type of transportation system I viewed for 30 minute periods on both Friday and Saturday evenings. The results can be found on the chart below. It should be noted that there were more cars than any other type of transportation. This is what led me to focus more on transportation and parking with automobiles within Downtown Raleigh. My second data collection was based around the amount of time it took for people to park in Downtown Raleigh. By asking individuals how many minutes it took for them to find a space and park, it became clearer to me that I need to focus on the parking scene within Raleigh. A majority of individuals reported finding parking within 5 to 10 minutes. These findngs were recorded on a Friday and Saturday afternoon. 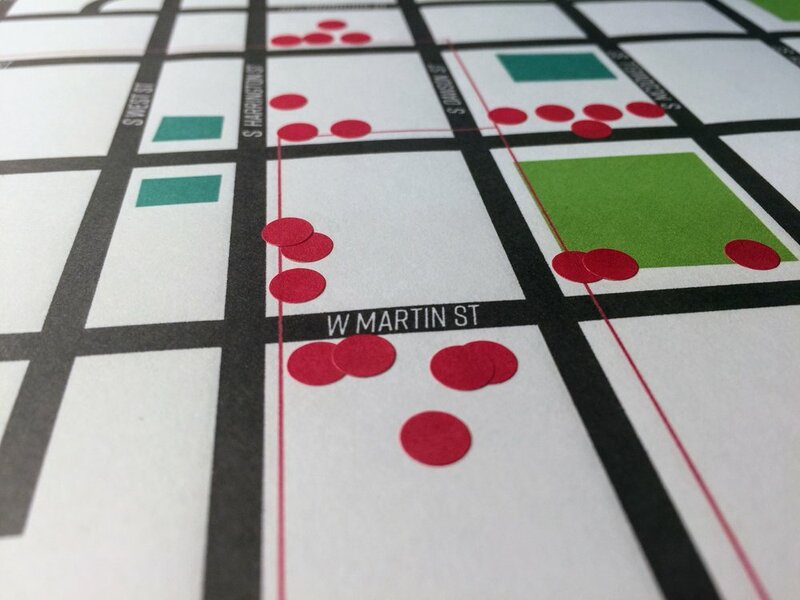 In order to further engage the users to understand the problem that existed with parking in Downtown Raleigh in a creative manner, I created a map of the Warehouse District. When people would enter the gallery in which I was working, I would ask them to place a small, red sticker in an area close to where they remember parking. The map itself was printed on 7.5 x 11 paper, and the streets were clearly labeled. When placing a sticker in the area where they parked, I also made sure to question them regarding the time it took for them to find parking in that specific location. I took note of these times and compared them to the data that was collected in the earlier stage of observation. As with the previously collected information, the average time to find a parking spot was around 5-7 minutes and many people weren't satisfied with this length of time. 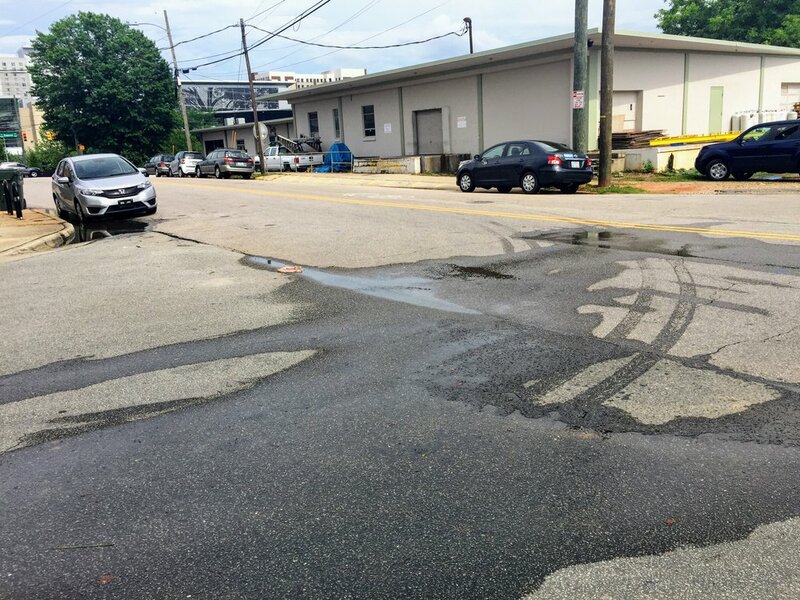 Both the observations and the survey results give reason to believe that parking in Downtown Raleigh is a wicked problem that could be provided with a solution. Many users reported their aggravation with the system that is currently in place with many citing it as the reason they dislike coming Downtown in the first place. In order to further visualize these data points, I decided to combine them into a singular graphic. After collecting the data from individuals who had recently parked in Downtown Raleigh, I had the idea to combine two data points. While asking people where they had parked, I also made the effort to ask them how long they believed it took them to park where they did. This would consist of the length of time it took to pay parking, work the meter, and any other related tasks. I noted where people had the most difficulty finding spaces and combined all of the information into the map of the Warehouse District of Raleigh, NC above. The larger dots signify that more people parked in that specific location. The darker the dots, the longer time the user reported spending finding a spot to park in. With this graphic, we can conclude that many people prefer to park in the inner city area. This allows individuals to be closer to the things that they are coming downtown for, as well as easier access to the streets. With more people parking in the inner portions of the Warehouse District, it can be also noted that it took much longer for them to find spots to park in these areas that those who parked further away. This information is what I used to futher my understanding of the problem that exists with parking in Downtown Raleigh and led to the formation of my wicked problem and question. Since the experience that I was observing is the transportation system within Downtown Raleigh, specifically automobile transportation, the action map and stages of action for my identified user group is quite minimal. The user group that I primarily focused on for this experience is that of the working class. These are people who might live outside of the city, where they work, and commute to work on a daily basis by driving. I outlined the steps and actions that might take place within this group on my action map. These stages can be seen above. Having broken each of these stages down, I chose to focus on the second stage. This stage, finding a place to park and getting to places on time, is the action that I believe to be the most problematic portion of this entire experience. The question that I decided to move forward with is as follows: how do we make the process of finding parking spaces in Downtown Raleigh easier and make the act of parking a quicker process? Through the exploration of this question, we can hopefully come up with a solution that simplifies this process and allows for people to manage parking in city areas easier. Having previously determined the problem with parking in Downtown Raleigh, I came up with and brainstormed a variety of solutions that could potentially make this process easier. 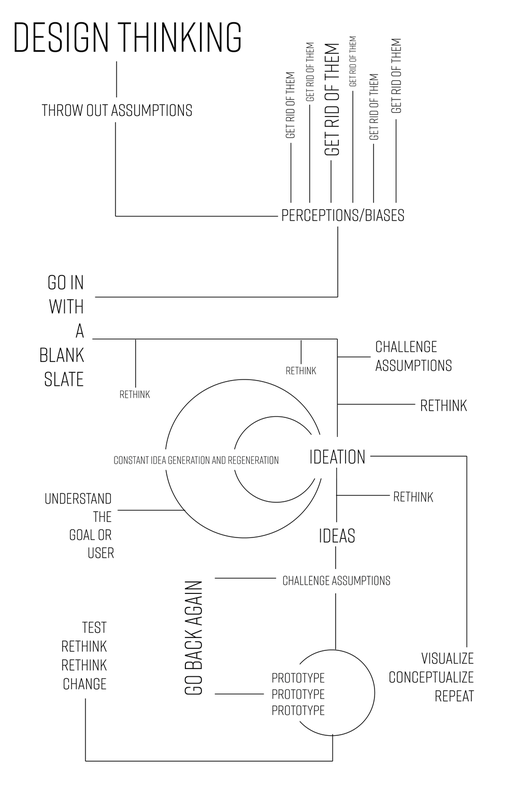 During the ideation process I made use of many different techniques including brainstorming, vertical thinking, problem framing, and idea exploration. Each of these different techniques allowed to me explore the wicked problem that I witnessed within the Warehouse District specifically. The problem that I am looking at is that of the difficulty people have parking downtown, finding spaces, and managing their meters. I explored different ideas and came up with some concepts that I furthered explore with the next phase of the Design Thinking process. After ideating on solutions for this problem, I looked back over some of the ideas that I had come up with and decided that creating a mobile device that could track where available street parking was would be an interesting concept. Using Adobe Illustrator, I quickly assembled some quick "sketches" of what I believed would be the most helpful aspects of this mobile application. This is what I decided on further conceptualizing as I moved forward with this process. The initial forms of prototyping that I made use of during this stage of the assignment were that of paper and working prototyping. My suggested solution to the wicked problem of limited parking/finding a parking spot is to develop an app to help out with locating nearby parking in Downtown Raleigh. Since I'm majoring in Graphic Design, and due to my interest in UX design, I chose to prototype an app that would best provide a solution to the wicked problem I am looking at. Both of these allowed me to further ideate on the design of this product and to further understand the layout. The first stage of this process was to build on the ideation sketches that I had initially come up with. These sketches allowed me to think about the need of the user and design an interface that addressed the prominent problems that exist with parking. By cutting a rectangle out of plain, white paper and making sketches of different screenshots, I created a prototype where the user could slide through a variety of screens. While this paper prototype allowed me to further my understanding about the needs of the user, I didn't feel totally satisfied with this prototype. For this reason, I once again used Adobe Illustrator to visually prototype and animate an application that I believe would help tremendously with this problem. Parkasus, a play on the word Pegasus, is a mobile application that allows people to find nearby street parking, keep track of parking meter time, repay the meter and a variety of other things. This final prototyping of the design shows different functions of the application and clearly addresses the wicked problem at hand. No longer will users have to wonder around the city looking for available street parking. Parkasus allows for users to find parking close to their desired destinations and maintain a variety of information from afar. Users can find parking nearby their desires location and reserve them before they even leave the house. Parkasus acts like any other mobile mapping application and can provide the user with a variety of information. This includes directions, recent locations, attractions, etc. 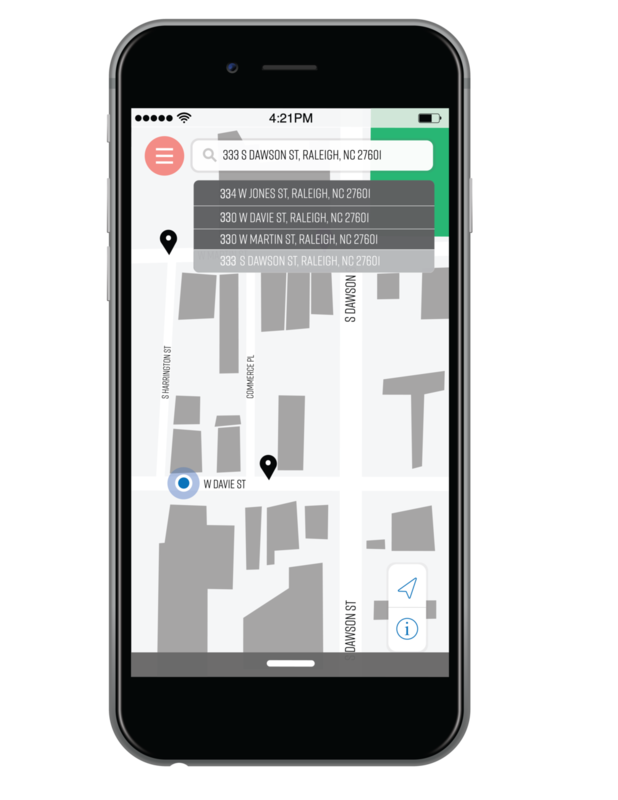 If the user is driving downtown and has the application open, nearby parking spots pop up and provide the user with information about that specific spot. This short video shows the application functioning and exhibiting a combination of special features Parkasus has to offer users. The final testing of my parking application, Parkasus, was completed using the final digital prototype that is shown above. I provided screenshots, animations and demos to a handful of individuals who I believed could be possible users of this software. I chose these users to test my project due to two major reasons: proximity and likelihood of use. Each of the users that I tested this product on are employed by a local college admissions software company. During this process, the users that were selected watched the animations, interacted with the graphics and screenshots, and provided feedback in regards to user experience, design, and the overall effectiveness of the software. I asked simple questions about their opinions of certain screens and for possible improvements. The users provided similar feedback that could be used to further enhance the design, effectiveness, and overall usefulness of the application. Throughout this assignment, I have tried to challenge my assumptions, biases, perspectives, and overall critical and creative thinking process. Being that this is the last assignment for this course, I believed that challenging the way I went about solving problems and coming up with solutions was totally necessary to the outcome of an effectively designed product. Before this assignment, I never attempted to stray too far outside my comfort zone and I can say, with this project reaching completion, that I have done this. In the very initial stages of this assignment, I came into things with a preconception of what I was going to set out to do. Rather than observing traffic patterns and parking in Downtown Raleigh, I was already attached to the idea of observing a retail/dining experience. While I believed that this would be something very interesting and exciting, I came to the realization that I might not benefit from this experience unless I somehow changed directions and challenged myself with a different experience totally. This is when I dropped my initial thoughts and switched gears. I came up with a different idea as to what I was going to observe, something out of my comfort zone, and did exactly that. This may not constitute as challenging one of my assumptions, but this is a time within this project that I definitely stepped outside of what I was personally comfortable with and challenged myself to think in an entirely different way. 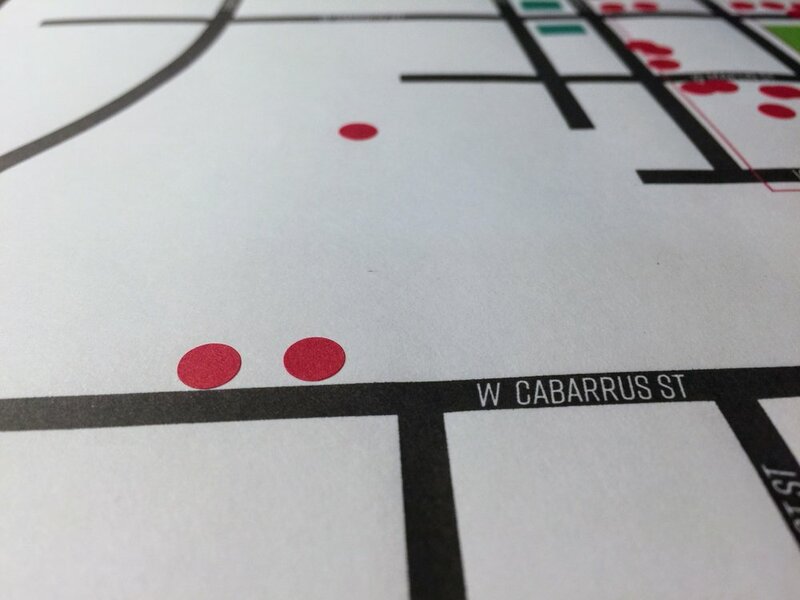 After gathering my initial data and observing traffic patterns and transportation within the Warehouse District of Downtown Raleigh, I felt stuck. I didn't know which direction to go with in regards to a wicked problem. While there may exist many problems within this system, from a outsider’s point of view, it began to seem difficult to come up with solutions to those problems. I started observing transportation as a whole, knowing that I should probably pick something more specific to collect data on, yet not knowing what exactly to choose. I believe I had two major breakthroughs during the time I was working on this assignment. My first breakthrough came after observing the transportation system as a whole and withering it down to just looking at cars and the process of parking downtown. While this may not seem entirely significant from an outside standpoint, this is what directed the rest of my work in this assignment. 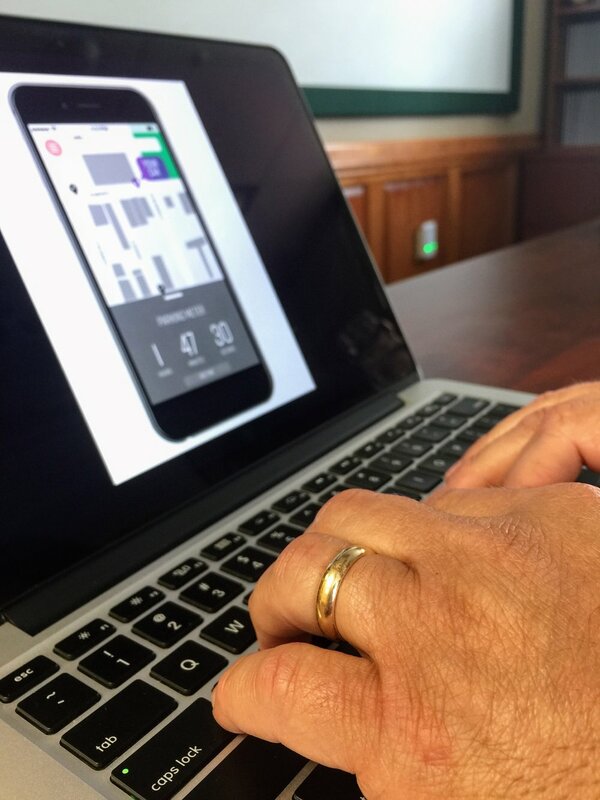 The second breakthrough came when I thought of the idea to incorporate street parking into an application for a mobile device and through the process of designing and animating this application. Being a graphic design major, I thoroughly enjoyed working on this portion of the assignment and got a lot of satisfaction from the prototyping and ideation phases. I honestly feel that I went deep enough in terms of the prototyping stage but believe that there is definite room for improvement within the ideation stage. While I came up with numerous ideas as to how this wicked problem could be potentially solved, once I thought of the idea to incorporate street parking into an effective, simple mobile application, the idea persisted within my brain. Since, as previously mentioned in this course, the brain is hardwired for efficiency, I had difficulty coming up with creative solutions after this idea had been formulated. Overall, I enjoyed working on this assignment and working through the multiple stage of the design process. If I had to do this again I would make sure to go into the problem with a totally clean slate and attempt to never get tied down to a single idea. There is much importance in the act of the constant formulation of new, creative ideas.